3 shows in Tôkyô (Kabukiza, EX THEATER), 2 in Fukuoka (Hakataza), 2 in Ôsaka (Shôchikuza) and 1 tour (Zenshinza)! Living National Treasure Onoe Kikugorô, Living National Treasure Nakamura Tôzô, Nakamura Tokizô, Nakamura Jakuemon, Nakamura Shikan, Nakamura Baigyoku, Nakamura Kaishun, Nakamura Ganjirô, Nakamura Kankurô, Nakamura Shichinosuke, Onoe Kikunosuke, Kataoka Takatarô, Nakamura Kinnosuke, Ichikawa Somegorô and Onoe Shôroku perform at the Kabukiza ! Young actors perform at the Shôchikuza! Ichikawa Ennosuke and the Omodakaya guild perform at the Hakataza! Ichikawa Ebizô performs at the EX THEATER! Nakamura Kankurô's two sons Nakamura Kantarô III and Nakamura Chôzaburô II make their debut on stage (hatsubutai)! These two programs also celebrate the 390th anniversary of Edo Kabuki (Okuni and her troupe performed at the Shôgun palace in Edo in 1607). Saruwaka Edo no Hatsuyagura: Kabuki began with sensuous dances by a woman named Okuni and comic routines with a man named Saruwaka, who eventually led to the founding of the Nakamuraza, the oldest and most important of the three licensed theatres of Edo. This play evokes those figures and the earliest days of Kabuki. Starring Nakamura Kankurô in the role of Saruwaka. Featuring Nakamura Shichinosuke, Nakamura Ganjirô and Bandô Yajûrô. Ôakinai Hiru-ga-Kojima: this is a jidaimono history play set at the end of the Heian period (12th century). It is a time when the powerful Heike clan lives in splendor, eclipsing their rivals, the Genji clan. The leader of the latter, Minamoto no Yoritomo is now in exile. Masaki Kôzaemon (Onoe Shôroku), a writing-master in Shimoda, Izu Province, lives with his wife Ofuji (Nakamura Tokizô). Kôzaemon and Ofuji are always having matrimonial quarrels because he is so shameless with other women. But however often they argue she always pardons him when he flirts with her. Due to Ofuji's habitual jealousy, one day when the beautiful Omasu (Nakamura Shichinosuke) appears at the door asking to become a pupil, Ofuji drives her away. Omasu is just on her way home when she encounters Kôzaemon, and he brings her back with him. Kôzaemon is, in reality, Minamoto no Yoritomo who is concealing his ambition to destroy the Heike clan. Ofuji, on the other hand, is really Princess Tatsu, the daughter of Itô Sukechika who is allied with the Heike. Furthermore, Omasu is none other than the daughter of Hôjô no Tokimasa, Yoritomo's ally. Princess Tatsu has Yoritomo's interests at heart and yields the position of wife to Masako. However, overhearing their intimate talk, Princess Tatsu is seized with jealousy. Just then, a mendicant priest named Seizaemon (Nakamura Kankurô) who is staying at Kôzaemon's house, strikes her with his Buddhist rosary and suddenly her sinful thoughts disappear and she comes to her senses. Seizaemon is, in reality, Saint Mongaku. He has brought an Imperial decree from the cloistered emperor Goshirakawa which orders Yoritomo to destroy the Heike clan. Yoritomo and Mongaku reveal their identities to each other. Yoritomo accepts the Imperial order and prepares to raise his standard to destroy the Heike. In this play loosely based on a true incident, two men, Fujioka Tôjûrô (Nakamura Baigyoku) and Tomizô (Living National Treasure Onoe Kikugorô), the former a masterless samurai, the latter a seasoned thief, break into the treasury of the Shogunate and steal the immense sum of four thousand gold coins. Though the samurai tries to use the money to support a normal life by starting a loan business, the other wastes his money gambling and resorts to extorting money from his former partner. The enormity of their crime makes it impossible to keep it secret and they are soon caught. 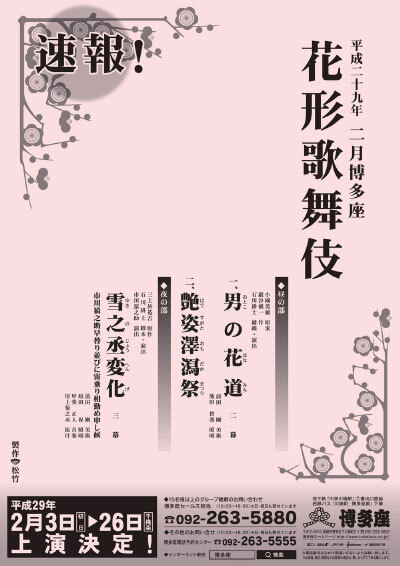 Written by Kawatake Mokuami, this play caused a sensation in its day for its realistic depiction of a Meiji period jail. Featuring also Nakamura Tokizô, Ichikawa Sadanji, Nakamura Kinnosuke, Onoe Shôroku, Nakamura Karoku, Bandô Hikosaburô and Living National Treasure Nakamura Tôzô. This dance portrays the brilliant atmosphere of Edo (the old name for Tôkyô). A fireman chief (Nakamura Baigyoku) and a geisha (Nakamura Jakuemon) dance with an ôgi jishi, a fan beautifully decorated with flowers and with a cloth trailing from the end. This decorated fan represents the head of a shishi lion, and the trailing cloth is its mane of hair. 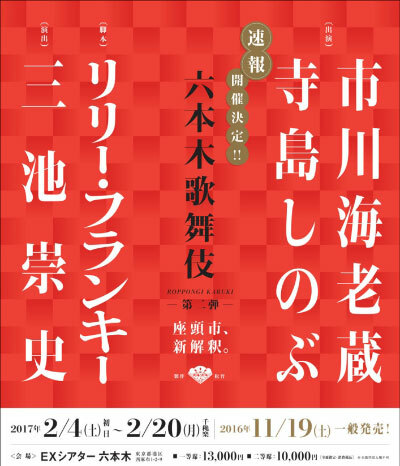 Kadonde Futari Momotarô: this is a play based on the famous Japanese folktale Momotarô (The Peach Boy). On this occasion, it is performed to commemorate the debut of Nakamura Kankurô's two sons, Nakamura Kantarô and Nakamura Chôzaburô. Once upon a time, an old man (Nakamura Shikan) carrying firewood comes to pick up his wife (Nakamura Tokizô) who is washing clothes in a river. Just then, a big peach comes floating towards them which they lift out of the water and take home. Out of the peach appears two energetic boys. These brothers, both called Momotarô, declare that they will head for Ogre's Island to vanquish the wicked ogres. The god of Kibitsu sends Inuhiko (Ichikawa Somegorô), Saruhiko (Onoe Shôroku) and Kijihiko (Onoe Kikunosuke) to accompany them. Following this, the Shintô priest (Living National Treasure Onoe Kikugorô) and the shrine maiden (Nakamura Kaishun) of Kibitsu Shrine, as well as the village headman (Nakamura Baigyoku) and his wife (Nakamura Jakuemon) all turn up to celebrate the boys' birth. The brothers put on armor and leave their house with the three others sent by the god. After a tough battle against the ogres at the Ogre's Castle, the Momotarô brothers capture the ogres, receive much treasure from them and return home triumphantly. Starring Nakamura Kankurô as Kansaku (the son of the grandparents) and the commanding general of the ogres, and Nakamura Shichinosuke as Kansaku's wife Otsuru. Amagasaki Kankyo: Akechi Mitsuhide (known in this play as Takechi Mitsuhide) is known as the "three day ruler of Japan", having only control for a brief time after attacking and killing Oda Nobunaga (known in this play as Harunaga) and before being defeated in turn by Toyotomi Hideyoshi (known in this play as Mashiba Hisayoshi). In the most famous act of this play, after assassinating Harunaga, Mitsuhide comes to see his mother, but she refuses to forgive him for betraying his lord. Mitsuhide sees his son and mother both die before his eyes as he tries to defeat his rival Hisayoshi, but instead is confronted with the drama of his own immediate family. Starring Nakamura Shikan and Nakamura Kinnosuke as Mitsuhide and Hisayoshi. Featuring also Nakamura Kaishun, Nakamura Ganjirô, Kataoka Takatarô and Kataoka Hidetarô as Mitsuhide's wife Misao, Mitsuhide's son Jûjirô, Jûjirô's fiancee Hatsugiku and Mitsuhide's mother Satsuki. Ume Goyomi: this work is a Kabuki adaptation of a famous love story from the Edo period called "Shunshoku Ume Goyomi". Tanjirô (Ichikawa Somegorô), the foster child of a rich merchant in the Yoshiwara pleasure quarters lives with Yonehachi (Nakamura Kankurô), a geisha of the Fukagawa district, even though he has a fiancée named Ochô. Adakichi (Onoe Kikunosuke), another geisha in Fukagawa, falls in love with him at first sight as they pass each other on boats, and she and Yonehachi become rivals for Tanjirô's love. Tanjirô’s master Chiba Hanjirô (Nakamura Karoku) was disowned for losing a precious tea caddy named Zangetsu, the heirloom of the Hatakeyama clan, and he now lives at Tanjirô's house. Adakichi persuades Furutori Sabunta to sell the tea caddy in his possession as she wants to get it for Tanjirô who is searching for the lost one with Hanjirô. But this tea caddy turns out to be a complete fake. Tanjirô recovers the genuine one after great difficulty and hands it to Hanjirô. As a result, Hanjirô is permitted to return to his house and the ill feeling between Adakichi and Yonehachi dispels and they make up. A special Kabuki program with seven young actors. Tokaiya/Daimotsu no Ura: these are two scenes from one of the greatest classics of the puppet theatre, which has also become a classic of Kabuki. After the wars between the Genji and Heike clans, the Genji are victorious and their leader Yoritomo is now Shôgun. But there is a falling out between Yoritomo and his brother Yoshitsune, the brilliant general responsible for the victory. Now Yoshitsune is fleeing through the country and this play fancifully has him encounter several famous warriors from the Heike clan, who are not dead, as history has it. Yoshitsune (Bandô Shingo) books passage on a boat to Kyûshû, but the captain is actually Taira no Tomomori (Onoe Matsuya), a general of the Heike clan that Yoshitsune helped to defeat. Tomomori was supposedly killed by Yoshitsune in the final battle of the war, but in this play, Tomomori is shown as surviving, living in disguise with the child emperor Antoku and his nursemaid (Nakamura Kazutarô). At one moment the captain is a gallant commoner, but in the next, he is Tomomori, a high ranking general close to the emperor. His wife as well is a cheerful commoner who shows her true identity as a high-ranking lady-in-waiting in the magnificent robes of the imperial court. Tomomori uses the opportunity to try to get his revenge on Yoshitsune but is defeated again. Finally Tomomori holds a giant anchor and plunges into the sea. The characters in this graceful dance are not actually dolls, but are three characters that are often depicted with dolls, a courtesan (Bandô Shingo), a handsome youth (Nakamura Baishi) and a samurai footman (Nakamura Tanenosuke). Kinkakuji: "Kinkakuji" retains the epic scale of plays adapted from the Bunraku puppet theater and is full of miracles and larger-than-life characters common on the puppet stage. It is full of the classical forms of all kinds of stylized characters and the role of Princess Yuki is considered to be one of the most difficult and beautiful roles for an onnagata female role specialist. Matsunaga Daizen (Nakamura Matagorô) has defeated the Shôgun and has set up base in the Golden Pavilion. The brilliant strategist Hisayoshi, disguised as a disgruntled retainer named Tôkichi (Nakamura Kashô), pretends to come under Daizen's employ to try to sabotage his plans from within. Princess Yuki (Nakamura Baishi) is being held prisoner by Daizen, but is able to free herself by drawing a mouse in the cherry petals of the tree that she is tied to. It comes to life and chews the ropes holding her. Starring the best of the actors in their prime in a production sure to be full of fire and excitement. Renjishi: 2 entertainers dance a tale of the legendary shishi or lion-like spirits that live at the foot of a holy Buddhist mountain. There is a comic interlude with 2 Buddhist pilgrims. Then, the shishi themselves appear and perform their dance with wild shaking of their long manes. The dance shows a parent shishi forcing his cub to undergo harsh training in order to grow up strong. This theme is often associated with the training a parent actor gives his son. This performance features Onoe Matsuya in the role of the parent shishi and his son Onoe Ukon in the role of the cub. Otoko no Hanamichi: this is a stage version of a popular movie. It is about the famous Kabuki actor, Kagaya Utaemon (Ichikawa Ennosuke). When he is about to lose his eyesight, he is saved when he happens to meet a doctor who knows Western medicine at his inn. The two become fast friends. Several years later, when Utaemon is now the top star of the Kabuki theater, he gets an urgent summons from the doctor and the actor is faced with the dilemma of whether he should go to his friend and benefactor, even if it means missing his all important appearance on stage. Featuring also Ichikawa Monnosuke, Bandô Takesaburô, Ichikawa Emisaburô, Ichikawa Emiya, Ichikawa En'ya, Ichikawa Omezô and Ichikawa Juen. 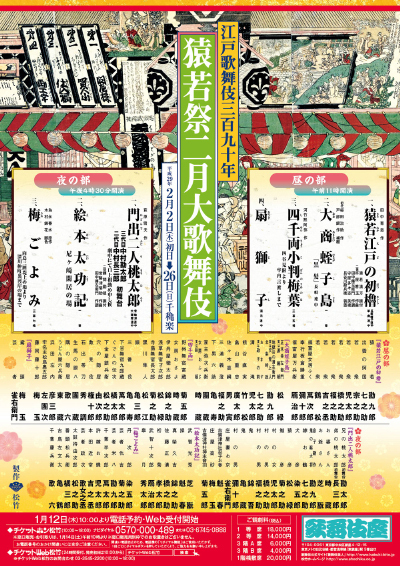 Hade Sugata Omodaka Matsuri: a newly-created dance-drama celebrating the actors of the Omodakaya guild. Yukinojô Henge: this is the story of the fictious Kabuki actor Nakamura Yukinojô (Ichikawa Ennosuke). His parents were driven to suicide by three local officials when the actor was just a child. He grew up to become a well-known onnagata. In 1863, he travels with his Kabuki troupe to Edo. When he discovers his three archenemies in the audience, he plots revenge! Featuring also Ichikawa Monnosuke, Bandô Takesaburô, Ichikawa Emisaburô, Ichikawa Emiya, Ichikawa En'ya and Ichikawa Omezô. Second edition of the Roppongi Kabuki performances at the EX THEATER. Based on a script written by Lily Franky, the stage direction is done by the famous movie director Miike Takashi, an expert in violent and bizarre movies who worked twice with Ichikawa Ebizô for the movies "Hara-Kiri: Death of a Samurai" (2011) and "Over your Dead Body" (2014). The story is about Zatô Ichi, the zatô Ichi, a blind masseur and blademaster who was created by novelist Shimozawa Kan. The guest star of this production is not a Kabuki actor but the actress Terajima Shinobu, the daughter of Living National Treasure Onoe Kikugorô. A February and March tour all over Japan for the Zenshinza troupe with the staging of the newly-created Kabuki drama "Ushiwakamaru"! 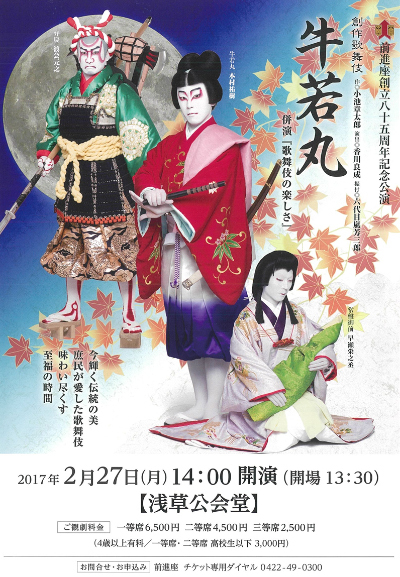 Among many others dates, they perform the 27th of February 2017 in Tôkyô at the Asakusa Kôkaidô. Ushiwakamaru: this newly-created Kabuki drama about Ushiwakamaru (the future young general Minamoto no Yoshitsune). 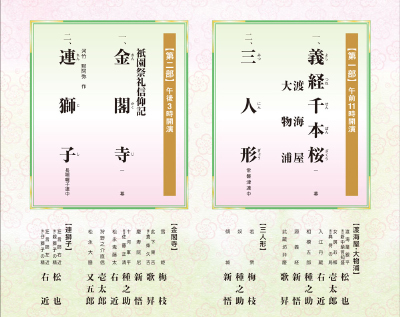 The three first ideograms of the title are yuki (snow), tsuki (moon) and hana (flower). Each one symbolizes one of the 3 parts of this drama. The first part is the village of Fushimi under the snow : after her husband Minamoto no Yoshitomo was murdered in 1160, Lady Tokiwa (Hayase Einojô) and her son Ushiwakamaru escape through the snow from Kyôto to nearby Fushimi. She is caught by her enemy Taira no Munekiyo. Instead of killing her and her son, he rescue the mother and his boy. The second part is set at the Gojô Bridge at night under the moon. Ushiwakamaru (Motomura Yûki) is now a powerful warrior picking fights on the Gojô Bridge in Kyôto. A stout warrior priest named Benkei (Watarai Motoyuki) challenges him. Vanquished, he becomes a disciple of Ushiwakamaru. The third part is set in Mount Kurama during the autumn leaves season. Ushiwakamaru, who cherishes the ambition of destroying the Heike clan, discovers that his new friend is actually a tengû, who promises to teach him secret tactics and war strategies.